The activities testing and tuning of the software lifecycle are concerned with analyzing program executions. Such analysis relies on state information that is generated by monitoring tools during program runs. Unfortunately the monitor overhead imposes intrusion onto the observed program. The resulting influences are manifested as different temporal behavior and possible reordering of nondeterministic events, which is called the probe effect. Consequently correct analysis data requires to keep the perturbation a minimum, which defines the need for monitors with small overhead. Measuring the actual overhead of monitors for MPI programs can be done with the benchmarking suite SKaMPI. It’s results serve as a main characteristic for the quality of the applied tool, and additionally increase the user’s awareness of the monitoring crisis. Besides that, the measurements of SKaMPI can be used in correction algorithms, that remove the monitoring overhead from perturbed traces. 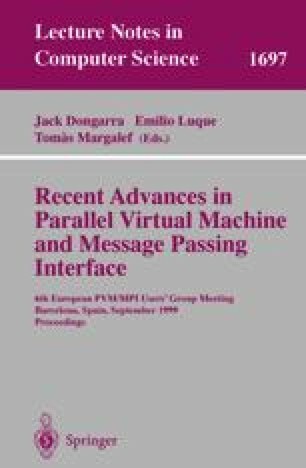 Message Passing Interface Forum: MPI: A Message-Passing Interface Standard-Version 1.1. http://www.mcs.anl.gov/mpi/ (June 1995).